Since around the 1600s there has been a steady decline of homicide rates in Europe. 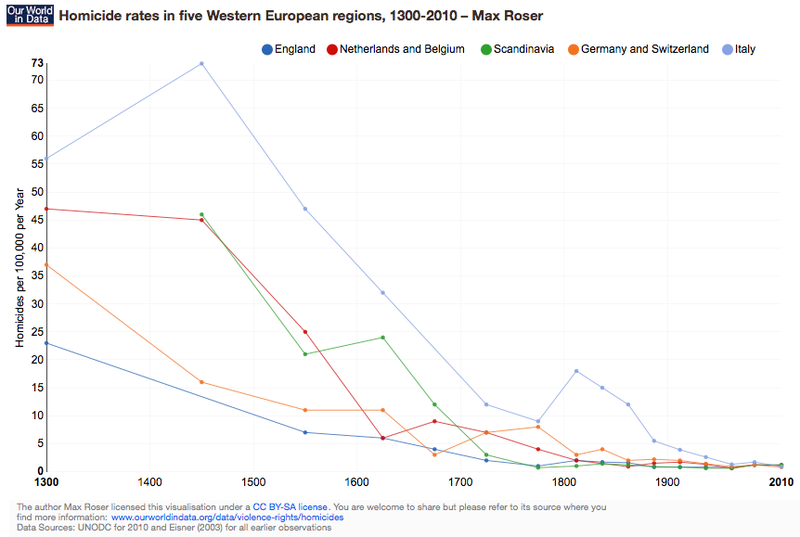 Many European countries had declining homicides by the 1400s. 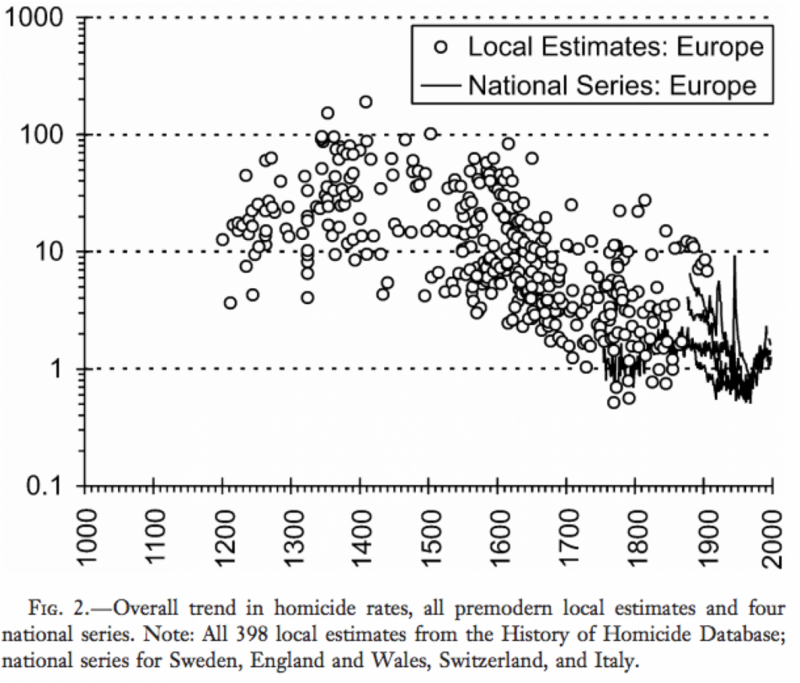 The decline in homicides coincides with two big institutions emerging. One, the advent of the modern state, and the other the rise of the market. Steven Pinker identifies both as possible reasons for the decline. It is hard to disentangle the effects of the market vs. the state since they both emerged about the same time. Yet, we can compare societies that are more market oriented to those that are less, to help disentangle the effects. 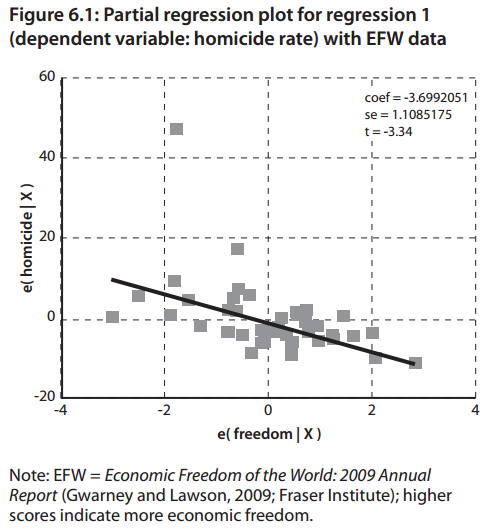 By comparing countries that are relatively more free market to countries that are less, we can see a strong correlation between free markets and lower homicide rates. 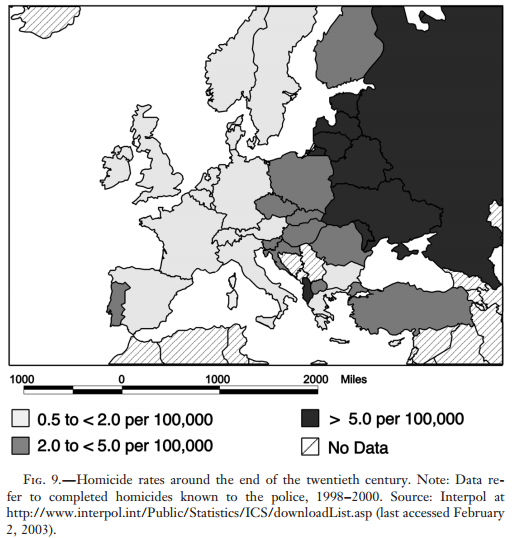 Manuel Eisner’s study shows the homicide rate mapped across Europe. We can see a pattern comparing the map from the Manuel Eisner study to the map from the website that supplements The Commanding Heights PBS series website. The countries marked in gray were not categorized. 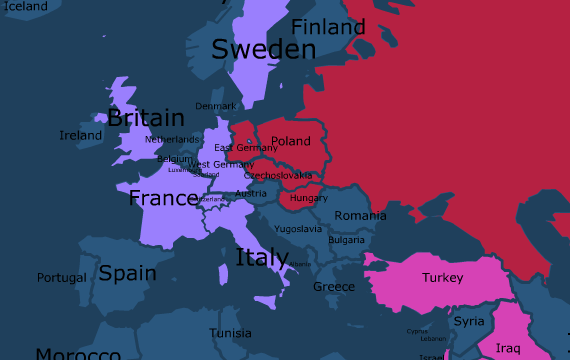 The countries colored per the legend at the top were categorized on a spectrum of economic freedom from command and control on the red end to liberal economies on the dark blue end. In 1988, the regions that had high homicide rates in 1998-2000 were under command and control economies. While the regions with lower homicide rates had more liberal economies. There is one outlier, Turkey. Yet if we go back another decade to 1977 we can see Turkey was also a command and control economy. By comparing countries with more state control over markets with countries with more free markets we can see a strong correlation between freer markets and lower homicide rates. This is not proof that there is a link between free markets and less violence, but it seems to indicate markets might be a factor in lowering violence. An interesting follow up article would be a map of countries based on income inequality and how that affects social unrest and crime. As always, thanks for sharing this!